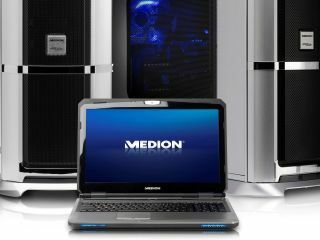 Medion announced the arrival of its first gaming laptop in the UK this week – the Medion Erazer X6811. The German computer company isn't known for gaming laptops in the UK, this is because it has primarily used Germany as its testing ground for the Erazer laptop range. This was deemed a success, with the 17-inch version of the Medion Erazer X6811 selling out on its day of release in Germany. Medion brought the X6811 to TechRadar towers this week and we were impressed with what we saw. The Erazer laptop line seems a lot subtler in design compared to some of the heftier gaming laptops in the market. The only design flourish of note is the blue LEDs situated on the front. So if you are looking for a lappie that screams GAMER!! then maybe this isn't for you, but we liked the subtlety. The battery on the system is worthy of a mention, too. As there is a nine-cell on board, expect the machine to keep its power through even the most heated of gaming contests; for a while at least. The screen is LED backlit and offers 1366 x 768 HD resolution. We were shown a number of game demos by Medion, including Call of Duty: Black Ops. The machine's specs meant that graphically the game looked rich and immersive and there seemed no lag even when were shooting up most of the area. Although sound wasn't exactly cranked up to maximum, the inclusion of Dolby Home Theatre certification, two speakers and a sub will mean that sound will be as beefy as you want. And if it is not, you can always put a new sub into the spare slot. While all this was impressive enough, it's the price that is the real kicker. Coming in at a super-smart £949, the Medion Erazer X6811 is almost half the price of its competitors with similar specs. When we asked a Medion spokesperson how the company keeps the price down, they explained that its business model is to offer no customisation like other manufacturers, then buy the components in bulk at the beginning and this keeps costs to a minimum. This and Medion's mass market appeal, selling in supermarkets and through online retailers. Incidentally, the Medion Erazer X6811 will be one of the first gaming laptops to be sold in Sainsbury's (online only), so it will be interesting to see if consumers will want to purchase the X6811 alongside their groceries. The Medion Erazer X7811 15.6-inch laptop has a UK release date of November and will be available from Sainsbury's Online, priced at £949. The Medion Erazer X7811 17-inch gaming laptop will also available from www.sainsburys.co.uk and www.medion.co.uk. It has a price of £899.